Made by Maria: Oreo Pops! Ever since I had my first cake pop at Starbucks last year, I've been obsessed. (Cake pop tutorial post to come later!) But let's face it, cake pops are a PAIN to make. They are so darn tasty and cute, but man do they take a lot of work. Enter Pinterest and howdoesshe.com's Oreo Cookie Suckers. They are just as cute and fun as cake pops, but you get to cut out some of the steps! Don't get me wrong, the process is still very involved, but how can you not love these? I have found it is easiest to complete all of one step before moving on to the next. So first, carefully (and I mean carefully) unscrew the tops off of all of the Oreos. Who knew Oreos were so fragile? Don't worry if some of the cookies break, you can always glue them back together later with chocolate! Pour about 1 cup of the white Candy Melts into a microwave safe bowl (glass or ceramic work best), and microwave at 30 second intervals, stirring in between, until they are mostly melted. If there are small pieces that are still solid, stir the candy until smooth (they will usually melt on their own). Use a lollipop stick to scrape away some of the filling and make room for the stick. Dip the end of the lollipop stick in the melted chocolate. Make sure you get a decent amount of melted chocolate on the stick -- this is what acts as the glue to hold the stick in place and hold the top on. Place the chocolate dipped stick in the space you've created by scraping away the filling, and immediately top with the other Oreo half. Repeat until all of the Oreos have sticks and are ready for dipping. Now for the dipping... Cover your work surface with wax paper. Melt whichever color of Candy Melts you choose for dipping in the microwave using the steps above. Using a rubber spatula, scrape all of the chocolate to the front of the bowl (as pictured below). Hold the bowl in one hand and the Oreo pops in the other. 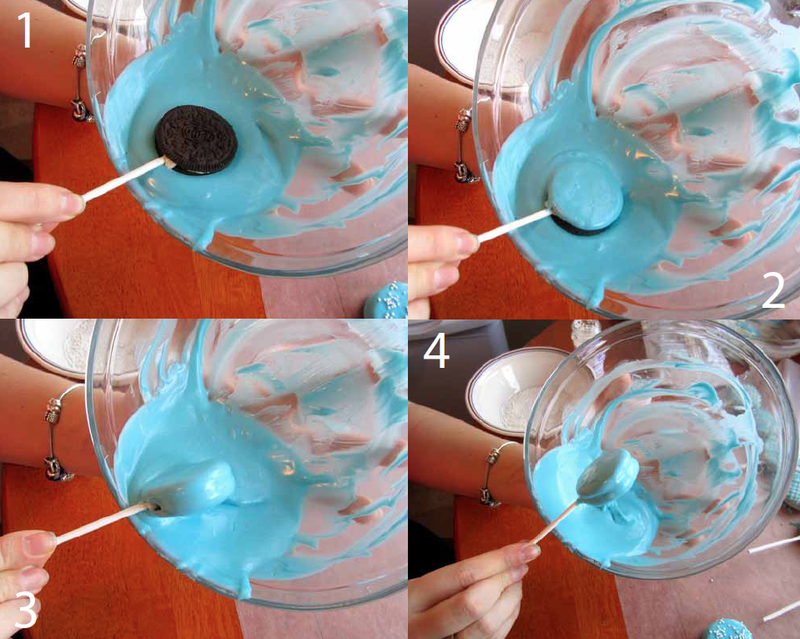 Dip one side of the Oreo pop into the melted chocolate to coat. Flip over and dip the other side. Roll the edge of the Oreo to cover the rest. Tap gently on the side of the bowl to remove the excess chocolate. Place immediately on wax paper. If decorating with sprinkles, do so at this point before the chocolate sets. Since I was making these for a co-worker's baby shower (baby boy, obvi), I dipped half of mine in blue chocolate and decorated with white sprinkles, and the other half I dipped in white chocolate and drizzled with blue chocolate. To get this drizzle effect, you'll need to use a zip lock bag. Fold the top down to make the process neater, and pour/scoop in some melted chocolate. Squeeze all of the chocolate into one corner of the bag, and twist the top (similar to using a pastry bag). Snip the corner off of the bag (the bigger the snip, the bigger the line of chocolate will be). 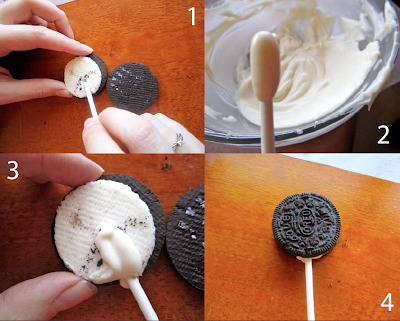 Drizzle back and forth over the Oreo pop in one direction, then the opposite direction. After you've dipped and decorated all of the Oreo pops, let them hang out on the wax paper for a while until the chocolate sets. Cut enough ribbon for each of the Oreo pops (I'd say about 7 inches long). Once the chocolate has set, put each Oreo pop into a plastic treat bag. Tie a cute little bow on each. And you're done! How cute are these? Just imagine the color and decoration combinations. Same question as above, how far in advanced can you make this?? Would love to make these for my daughters baby shower. How far in advance can these be made? Lots to do so if I can make these ahead of time, it would be wonderful! How long in advance can I make these ??? I would say not too in advance or the cookie will no longer be 'crunchy'..
Can these be done the day before?